On 22 April 2017, active users of social networks in Kazakhstan noticed a slow down access to the internet in the evening. Those using Chrome browser even saw small T-rexes jumping on the monitors. It has been so several times in a row for two hours. Naturally, versions of what is happening appeared immediately. Some internet users have suggested that the problem with access originated from network overload: they say, there are many people at once in the internet and the traffic falls periodically. Others began to blame on viruses-Trojans attacking different social networks. Still others suspected that all these oddities with access to the World Wide Web linked with the announcement of the former owner of BTA Bank Mukhtar Ablyazov about his own live interview on Facebook and Instagram social networks, which no one publicly desired to watch. Moreover, the overwhelming majority of internet users were simply not aware that ‘the enemy of the state No. 1’ is going to talk about something. At present, a case about the theft of billions of dollars against him in Alma-Ata is currently being litigated. The result was as anticipated. As it had been on 16 December 2016, when Mr Ablyazov's first interview came out after his release from the French prison, the effect of the ‘forbidden fruit’ worked well. Over the next few days his story about the confrontation with President Nazarbayev and the intention to revive the ‘Democratic Choice of Kazakhstan’ movement scored more than 310,000 views in total and a huge amount of comments. And this stream was not fully blocked. Absence of reactions and comments in the national mass media matters not, while very few of them are able to demonstrate such view scores. Allowing opponents of Mr Ablyazov to speak would not be unnecessary for the sake of truth. Officially, a freedom of speech is still there. Fergana News Agency willing to make up a deficiency, has allowed its experts an opportunity to express their opinion about plans of Mukhtar Ablyazov to revive the ‘Democratic Choice of Kazakhstan’ movement. Political expert Talgat Kaliev thinks that ‘the chances [to revive the DCK] are infinitesimal,’ while Mukhtar Ablyazov allowed himself to express ‘resentment against the incumbent president, seasoned with a thirst for revenge,’ which makes the politician less favourable for the masses. Human rights activist Bakhytzhan Toregozhina says, ‘the interview is not so much about plans as about the situation in which the opposition found itself in the conditions of the policy pursued by the authorities.’ She says that ‘no political party on the side of the opposition really claims to be in power,’ and marked a very strong pressure on civil society. 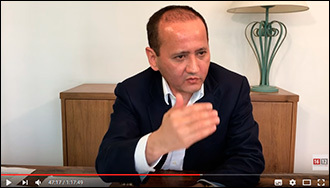 Politician Amirzhan Kosanov considers Mukhtar Ablyazov ‘posing a certain threat to the existing regime having experience of governing a large bank and being in the government.’ Mr Kosanov says that Mr Ablyazov knows true things about how the government is run, including ‘compromising information on the country's top leadership,’ which would be the reason for protests, noting about South Korea and Russia. Mr Kosanov thinks that Mr Ablyazov possesses enough financial resources for his political activity involving opposition organisations and the media, and relying on his previous experience with the political movement. A deteriorating social and economic situation in Kazakhstan, corruption and poor population feed protest feeling, Mr Kosanov continues, ‘the power itself pushed the opposition out of the legal field’, thus creating a wide field for the opposition to operate. Mr Kosanov concludes that it is too early to speak about strong support of Mr Ablyazov in Kazakhstan, who needs also to respond to shocking accusations about the BTA Bank to clear himself. Former USSR GRU officer (Military Intelligence) Elio Bokeria speaks that, ‘it seems that Mr Ablyazov has resolved all his judicial and legal issues in France, Britain, Russia and Ukraine. And now it helps him to make statements with ease,’ telling about the revival of the political movement and the dismissal of the President of Kazakhstan from his post. ‘Thus Ablyazov has the opportunity to slowly win the mind and souls of ordinary citizens, while simultaneously attracting more and more supporters of his movement. Since the economic situation in the country is not in favour of the president and the government, I would not exclude the fact that Mr Ablyazov can achieve his goals,’ Mr Bokeria concludes. Mr Beisebayev states about the fact of ‘the existing opposition parties are not represented even in maslikhats (councils) with no opposition as an institution, while the introduction of amendments to the Constitution and the current legislation, the field for expressing an alternative opinion has narrowed noticeably’, and with no chances to revive the movement in such circumstances.